Home » Personal Finance » Debt Management » Should You Pay Down Debt First or Invest? Should you pay down your debt before you focus on investing? This is one of the most important questions in personal finance, and the decisions you make now can greatly impact your financial future. The sooner you start investing, the more time your investments have to grow. The effect of compound interest creates a big incentive to start investing as soon as possible. Compound interest is responsible for the "snowball effect" that grows your small investment into a substantial sum over time. So what is the best money move — pay off debt or invest? However, there is a complication with this simple answer right off the bat. There is no way to know the rate of return from your investment accounts ahead of time! You could get huge investment returns, even higher than your credit card interest rate, or you could even lose money in the stock market and get negative returns. You have to make an assumption about your rate of return to decide where to put your money. The long-term historical average return from the stock market is around 8% including booms, recessions, and even the Great Depression. No one knows what is going to happen in the stock market, so a reasonable assumption is that you will get returns consistent with the long-term average over the long run. So if the interest rate on your debts is higher than about 8%, you are better off paying debts down first rather than investing. If you have low interest debts such as a mortgage or student loans, you are better off making minimum payments on your debts and investing as much as possible to get the maximum return on your money. As I said, this is the simple answer. There are a few details that make the decision of whether to pay debt or invest a little more complicated. Let's look at some of them. Even with the simple assumption that the long-term historical stock market return of around 8% will continue into the future, there are other complexities to consider in the decision between paying off debts or investing. There are negative consequences of carrying debt that go beyond mathematical calculations of return on investment. Carrying debt is stressful. You have payments to make every month and face immediate severe consequences if you can't make them. If your source of income is disrupted while you have a lot of debt, you can lose everything quickly. Paying off your debts can take this sort of risk off the table. There are other advantages to paying off debt as quickly as possible before focusing on investment. For one thing, focusing on paying off debts is a good deterrent to borrowing more money. If you have investments that are growing, you might be more likely to take on additional debt if you have debt already and are not focusing on paying it off quickly. Paying down debt can be a good way to focus on your financial health and develop sustainable spending habits. So the risk of carrying debt tips the decision toward paying down debt first, but as I mentioned, life isn't simple. If your employer offers a 401K retirement account matching funds program, the balance tips toward investing. Many companies will match employee retirement contributions with 50% matching funds. This is free money! For example, if you contribute $500 to your retirement fund and your company has a 50% matching program, the company will add $250 to your retirement account. This can tip the balance in favor of investing. If you have $500 available per month, the choice effectively becomes $500 for debt payments or $750 for retirement contributions. This makes investing hard to beat. Let's not forget about taxes. Another advantage of investing in a retirement account is that you can invest pre-tax dollars in an investment program such as a 401K. When you pay debt, you are paying it with post-tax dollars. The impact of pre-tax vs. post-tax dollars is that you can effectively put more money in your retirement account at the same cost to you. For example, you could invest $665 before taxes or pay down a debt with the $500 you get after taxes. This results in an advantage for investing instead of paying off debt. It is true that some types of debt such as mortgages and student loans have tax advantages. You can get a tax deduction for mortgage and student loan interest, but this benefit is small compared with the tax advantages offered as incentives to fund retirement accounts. Another variable that you may be able to change to tip the decision toward investing is the interest rate on your debt. If you can refinance your high interest debt with a debt consolidation loan or a balance transfer, you will save money on interest — and investing before paying off your debt may make sense if your interest rate is lower than your investment returns. Let's say you have $20,000 of credit card debt at 12.9% interest. Are you better off paying off that debt first as fast as possible before investing, or should you pay the minimum balance on the debt so you can start investing as much as possible right away? If you wait to start investing until you have the debt paid off, you will miss out on years of growth of your investment account. However, the longer you leave the high interest debt around, the more it will cost you to pay back. What should you do in this scenario? Let's say you have $535 per month that you can use to pay a credit card debt or invest for a term of 25 years. A monthly payment of $535 per month will pay off the $20,000 credit card debt at 12.9% interest in 48 months, or four years. The total cost of paying it off is $25,700 due to compound interest. Now, after four years, you start investing the $535 per month. It grows at the historical average return of 8% for 21 years. You end up with $348,000 in your retirement account. That's pretty good! In this scenario, we will make a smaller payment on the credit card of $297 so we will be able to invest the rest of the $535 per month that we have available, or $238 per month. With our minimum credit card payment, it will take 10 years to pay off the credit card balance at a total cost of $35,800. It takes much longer to pay off the credit card by making smaller payments, but this move allows us to start investing right away. Our 10 years of investing $238 at the historical average 8% return gets us $43,500 in our investment account. We'll start with this balance and invest the full $535 per month for 15 more years. The final balance: $329,000. In this scenario, the high interest rate on the credit card debt still outweighs the lower rate of return from the investment account. With high interest debt, the best move is to pay it off before starting to invest. The result above does not include the 401K company match or the use of pre-tax funds. Considering these investment incentives, the balance at the end of 25 years improves, but the choice between investing vs. paying off debt first does not change. Without the Debt, You Would Almost Be a Millionaire! So what is the effect of having $20,000 of debt to pay off early in your investment cycle? If you didn't have debt and started investing right away, you would have $951,000 at the end of 25 years! Final Answer: Should You Pay Off Debt or Invest? The basic principle of putting your money into the option that gives the best rate of return leads to the best financial results. If your investments yield a higher return than the interest on your debts, then you'll be better off investing right away and making minimum payments on your debts. However, if the interest rate on your debt is higher than the rate of return from your investments, then you should pay off your debt first before investing. The example calculations showed results for a scenario where it would definitely be better to pay off high interest debt before starting to fund an investment account. One big conclusion from this analysis is how much debt impacts your investment growth. In our 25 year investment example, you could have about $300K more in your retirement account if you didn't start with $20K credit card debt. If you have high interest debt, look for opportunities to consolidate the debt or get a balance transfer and end up with a much lower interest rate. 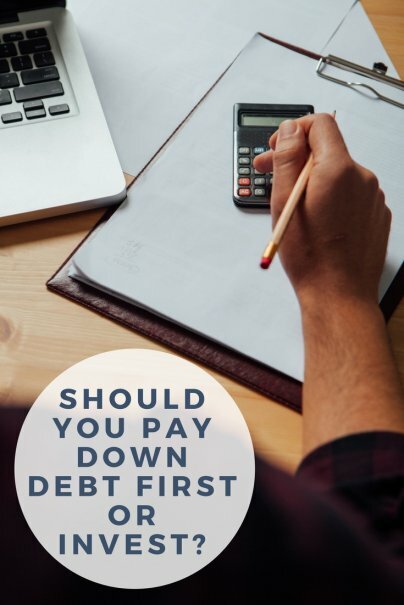 Ultimately the choice of whether to pay off debts before starting to invest depends on your tolerance for risk and your assessment of potential rate of return from investments in comparison with the interest rates on your debt. Are you investing or paying off debt? You're not taking into account that if you have $535 of your take home pay to either invest in a 401K or pay off debt. You actually can invest at least $713 a month in the 401K since it is pretax if you are in the 25% tax bracket (535/.75). If you assume 6% state taxes, the amount you could invest goes up to $775(535 /.69).